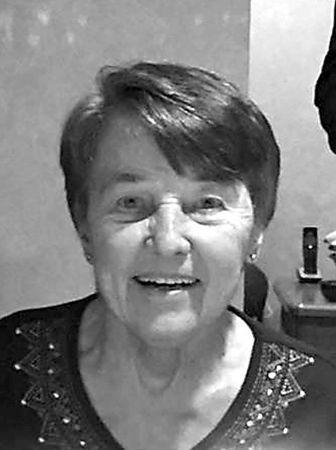 Genevieve “Jennie” DeCenty, 86, of Southington, formerly of New Britain, passed away peacefully in the early morning of April 6, 2019, at the MidState Medical Center, with family members by her side. She was born in New Britain, on March 12, 1933, the daughter of the late Michael and Antoinette (Paskowski) Parulski. She grew up in New Britain and after graduating from New Britain High School, Class of 1951, was employed by the New Britain Herald’s advertising department as a proof runner and later, as a cost accountant for the Fafnir Bearing Company in New Britain. Jennie was a member of the New Life Church in Wallingford. Jennie enjoyed attending her grandson’s Little League baseball, youth hockey games and high school baseball, basketball, cross country and track meets. Cub Scout and Boy Scout activities and awards ceremonies rounded out her grandmother obligations. “Babcie,” as she was called by her five grandsons, was a devoted grandmother and sports fan who also enjoyed cheering on UConn women’s basketball teams. Jennie cherished time spent with family and holidays. Most importantly, she was loving, caring and generous. She was known as “the hugger” to everyone that knew her as she loved to hug others, friends, and strangers alike. In her post-retirement years, Babcia enjoyed watching Game Show Network telecasts with family members and friends who visited her and helped care for her and playing UNO, Racko, Banana-grams, and other board games. She loved going out to eat, riding her bicycle and visiting the Cape on the weekend. She is survived by two daughters, Deborah (DeCenty) Hayes and son-in-law, Scott, Donna (DeCenty) Nessing and husband, William; five sisters, Lucy LaFlamme, Dorothy Pryzybylo, Sophie Pyzow, Irene Courtemanche (Rene), and Bernice Murzyn (Henry); her grandchildren, Matthew Bajek, Ryan Nessing, Jeffrey Nessing (Reeann), Kaelan Hayes, and Logan Hayes; one great-grandson, Daniel Nessing; and several nieces and nephews. Jennie was predeceased by her sister, Anne Manning. Posted in New Britain Herald, on Wednesday, 10 April 2019 18:38. Updated: Thursday, 11 April 2019 15:37.